Monjayaki is a local dish of Tokyo. It is a type of Japanese pan-fried batter with various ingredients. 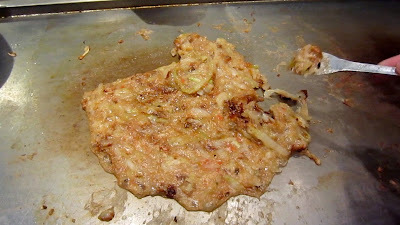 Ingredients are similar to Okonomiyaki (Japanese-style savory pancake) but very watery and less solid. 1. Place the solid ingredients on the pan. Cut and cook the ingredients. 2. Form the ingredients into a donut shape, then pour the batter in the middle of the donut and bring to a boil. 3. Mix everything up and leave it to be cooked. Eat by scraping off and browning a small portion of the mixture.